OKC.NET | The Museum of Osteology: Bone Up On Your Body of Knowledge! The Museum of Osteology: Bone Up On Your Body of Knowledge! “We’re just presenting the facts,” says Villemarette. “It’s not our intention to offend anybody. For the most part we have people who are very respectful and amazed at what we put together,” said Williams. “Ultimately we’re in it for the education.” Photo by Natalee Dobbs. What has 300 skeletons, 400 skulls, and sneaks a whole bunch of education into an entertaining afternoon? The answer is Oklahoma City’s very own Museum of Osteology. Located in the southeast side of the city, the museum has 7,000 square feet of beautiful and meticulously arranged displays of animal skeletons, spread out over two floors. The Museum of Osteology is the vision and creation of Jay Villemarette. At the age of 7, Villemarette found his first dog skull in the woods and thus began a lifelong passion for skeletons and skulls. For years he collected and sold skeletons as a hobby, but when he was laid off from his job as an autobody mechanic in 1986, he founded a company called Skulls Unlimited International Inc. and began processing and selling bones full-time, much to the dismay of his new wife. Skulls Unlimited flourished and in turn helped bring to fruition Villemarette’s dream of creating the nation’s only skeleton museum. In 2003 he erected the building that houses the museum and the attached Skulls Unlimited gift store. It took 7 years to collect specimens and create the displays. The museum finally opened to the public in October 2010 and has been doing steady business ever since. The Museum of Osteology is a great museum for kids. The majority of the specimens are safely behind glass, but the largest and most impressive skeletons are on display for kids and adults alike to touch. There are also “Scavenger Hunt” worksheets for all age levels and an “Explorers Corner” where kids can handle real animal bones and identify mystery skulls. Visitors can view skeletons from all 7 continents, and all major vertebrate groups. There is even a special display of native Oklahoma animals. Though there are a few fossil specimens, most of the skeletons are from animal species that still exist today. Some skeletons come from endangered species, such as the Javan rhinocerous, which is dangerously close to extinction. The museum boasts an especially impressive collection of monkey and baboon skeletons and replicas of early human fossil skulls. In case you can’t get to the National Museum of Ethiopia to see the original “Lucy” skeleton – a 3.2 million year old collection of bones from a female Australopithecus afarensis – the museum has a beautifully constructed replica. The collection shows the evolution of the primate skull, from the small monkey-like skull of our earliest known ancestor into the human skull that we all have today. So how does the museum obtain its skeletons? Some specimens were collected in the wild from animals that died of natural causes. For example, a researcher working in Botswana during a severe drought in the 1980s collected the hippopotamus skeleton. Their large marine mammal collection primarily comes from animals that wash up on coastlines. The humpback whale suspended from the ceiling, which serves as the focal point of their collection, was stranded off the coast of Cape Cod, Massachusetts in 2003. The body washed up on shore and decomposed in a field for two years while Villemarette obtained the proper permits for acquiring and transporting the skeleton. Many skeletons are donated to the museum by a network of zoos nationwide, such as their African elephant “Tiki,” which came from the Dallas Zoo after the animal died of natural causes. Many zoos would prefer to have their animals “live on” in the museum instead of ending up in an incinerator. The human skeletons all come from donor programs, where people have donated their body to science. Williams says that some visitors have said they intend to donate their body to the museum, but so far no one has followed through on their promise. He hopes that it will be a long time before any of their patrons are ready for donation. Despite the great variety of animals in the collection, Villemarette says that there is one animal that they will probably never have: the giant panda. All pandas are owned by the Chinese government, and if a panda skeleton is given to an institution in the United States, it will probably go to the Smithsonian Institution in Washington, DC. All of the skeletons are processed and articulated on site. The museum has a colony of dermestid beetles which eat the skin and muscle off of the bones, getting into every nook and cranny. Once they are cleaned, the bones are treated with chemicals to remove oils and to whiten them. Then the staff assembles the bones into a biologically-accurate pose. After experiencing the vast variety of skeletons in the museum, visitors should be sure to exit through the gift shop. Looking for a gift for the man who has everything? He probably doesn’t own a snake skeleton or a stag beetle paperweight. Indie brides should be aware that the building can be rented for weddings. Though they have hosted many birthday parties, they have not yet hosted a wedding, but are excited to do so. Your wedding could be the first. Oklahoma is lucky that Villemarette grew up in the state and decided to open his museum here. 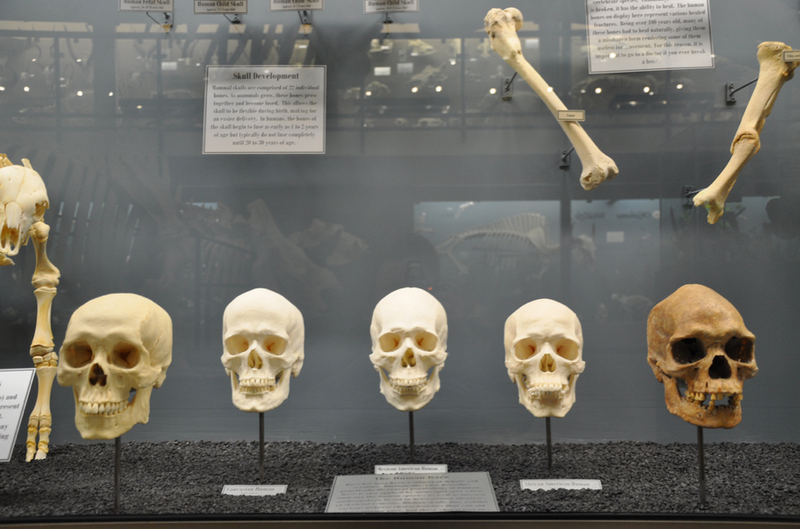 With such an impressive collection right in our own backyard, it would be a shame not to visit the Museum of Osteology. Tagged age, animals, Cape Cod, evolution, facts, Joey Williams, Photos, Scavenger Hunt, Skulls Unlimited, United States. Bookmark the permalink.